How Can You Tell Whether a Dog Has Ever Been Abused? What Can You Do Afterward? Adding a dog to your family can be exciting and highly rewarding. If you are adopting a dog, you might be concerned about any injuries, illness or behaviors that might be the result of abuse in the past. To tell if a dog has been abused is not always an easy thing unless known for certain. The dog may, however, give off some behavioral or physical clues that can be the result of abuse. To learn more read on. Dogs that have been abused by previous owners are often shy or hesitant of people. Abused dogs tend to hide away from people and other animals out of fear most times. Even when trying to coax them with treats or toys, they will cower, cry out in fear, or hide. Abused dogs will also be hesitant to explore a new environment. Once they have settled into a new home, it can be difficult to get them to leave the new home. While some dogs will be terribly fearful of human contact, other abused dogs can have the opposite reaction. Once they have trusted a new person, they will cling to them. This can lead to separation anxiety, causing the dog to exhibit destructive behavior when left alone. While an aggressive dog doesn't automatically mean it has been abused, it can be a concern. If the dog growls, bares its teeth, barks, or even bites, you should speak to a veterinarian to determine what the underlying issue could be. You will also notice the animal cannot be around others of its kind, will have noticeable scarring or wounds, and growl or bark a lot. While abused dogs can be more aggressive, there are many other problems that could cause the aggression as well. Dogs that have been abused can show signs of anxiety, but just like aggressive behavior, this can be caused by a number of factors. Nonetheless, if your dog tends to whine excessively, pant excessively, chew, dig, pace, has separation anxiety or urinates and defecates when not around their owners, these can be anxiety signs that point to past abuse. How to tell if a dog has been abused? Many abused dogs will have injuries you can't see but will notice in the way they move. If the dog appears to have trouble moving, either getting up, sitting, or lying down, this can be a sign of past abuse. Likewise, dogs that move slowly moves off balance, or doesn't like to be touched in certain area can all indicated an untreated injury from abuse. If the dogs appear too thin where you can see the bones below the skin, this can be a sign of abuse. Most dogs that are abused are often neglected and either starved or not fed enough. Dogs that have overgrown nails have usually been neglected or kept in a confined area where they could not properly wear down the nails themselves. While it may not seem like a major issue, it can be a sign of previous abuse. Skin conditions such as wounds, bumps on the skin, scaly skin, burn marks or scars in the dog can be a more obvious sign of abuse. Be sure to look at your dog's skin closely and take note of any unexplainable skin conditions. 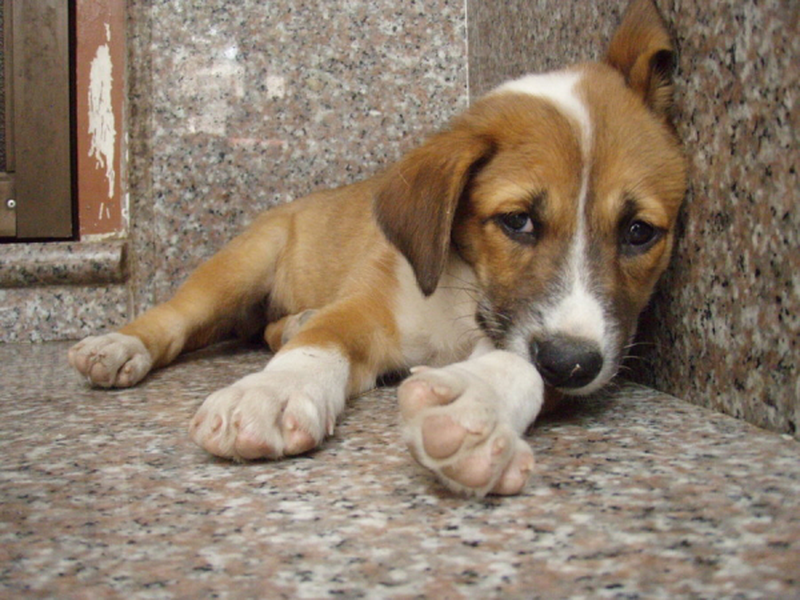 Most abused dogs often are infested with fleas, ticks or parasites. While these can be common for even the most well taken care of dogs, it can be a major issue for dogs that have been neglected. How to tell if a dog has been abused? Take a look at their fur or coat. While each bred will have a different coat, some being short and stiff and others being long and soft, they should be free of tangles or clumps. Overgrown, matted, and noticeable dirty fur can point to signs of past abuse. Along with having tangle or matted fur, be aware of any loss of fur. If the dog's fur seems to fall out in handfuls, then this can be a sign of poor grooming or an underlying health condition that hasn't been treated. If you have rescued a dog that has been previously abused, there are ways you can help them. Understand that no change will happen overnight and some dogs will need a lot more work to rehabilitate than others. While your dog may not have a full recovery from the abuse, with consistency and a lot of love, you and your dog will be very happy together. To assist you in making the transition easier for you, your family and your new dog, be sure to utilize these tips. Always make the dog feel loved. You want to show your dog as much attention as you can and help them learn to trust you through clear, loving communication. Create a safe place just for him. It may take him a while to get used to a whole new home, so having a small space just for your dog will allow him to adapt at his own pace. It is important not to force him into liking his new environment until the dog is ready. How to tell if a dog has been abused can be determined by what he fears. You want to do your best to protect your dog against whatever the fear is. Whether it is a particular noise, new people, or even getting into the car, you want your dog to trust that you will be there to protect them. Encourage your dog's progress. You want your dog to be successful with its transition and one way to do this is by praising, affection, and building their confidence. Be sure to focus on their nutrition. You want to give your dog a well-balanced diet, one which it may not be used to. Exercise your dog regularly as well. This can help combat anxiety and aggressive behavior. Server responsed at: 04/25/2019 4:25 p.m.